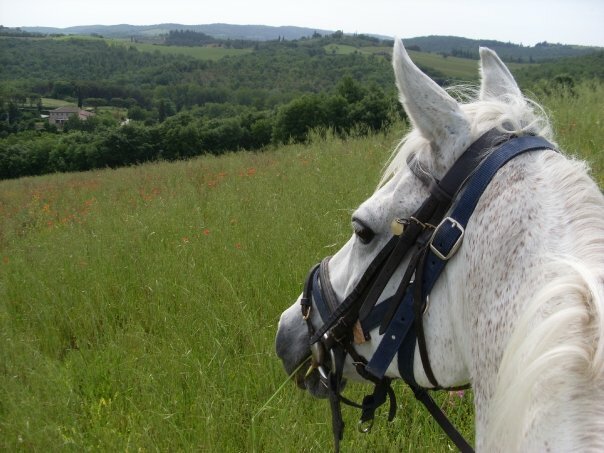 B&B Maison offers Horse Riding Packages in Tuscany starting from less than €89 pppn! 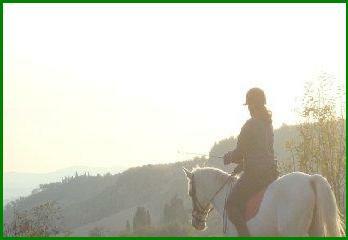 Have you ever dreamed of horse riding in Tuscany? Hacking lazily through the Chianti hills, the sun beating down on your back, meandering through olive groves and vineyards, taking a brisk canter through open fields with magnificent views, stopping at a medieval castle and sampling some delicious Tuscan wines, cheeses, hams.... then did you check the prices of horse riding holidays in Tuscany!? So what do you get for your hard earned money and why is it so cheap? €389 for a 4 night midweek break! You can choose to stay any number of nights you want, starting on any day of the week. You can choose from a range of ride outs, riding lessons or lunge lessons. We can book alternative tours for those who don't wish to ride. Discounts available for non-riders and children under 12. Anything else you want? Just ask! Ok, so why is it so cheap? Firstly because we don't have our own horses! As you know, they are a great expense! We take you to a great horse riding centre with beautiful horses and years and years of experience. Plus we have negotiated great rates for you. Secondly because the accommodation we provide is in the form of dormitory style accommodation with a maximum of 6 people per room, so you could be sharing a room with people you don't know. Before you run off screaming, remember this is great value if you are travelling as a group. Or if you are travelling alone and would like to meet new people. Or if you just cant afford a private room in Florence (if you want a private room in Florence you can expect to add at least another €100 on top of your bill for four nights accommodation, per person and that will not be full board accommodation or provide many of the services we offer, such as a free walking tour or museum entry). We have all kinds of people staying with us, of all ages, from young children up to pensioners! We can offer you private accommodation, but this brings the price up and the point of this holiday is firstly to keep costs down so everybody can enjoy the thrill of horse riding in Tuscany and secondly to enjoy the social aspect! We also cook breakfast and dinner for you, which keeps the cost of food down because you don't have to pay restaurant prices, and we can buy lots of food at cheaper prices. We also don't include the cost of flights or transfers from the airport, but if you fly into Pisa you can get cheap flights for as little at €10 return and the train which takes you directly from Pisa airport to Florence costs less than €6. We are a 10 minute walk from the train station, so no need for expensive taxis (although when you leave we will provide you a complimentary taxi back to the train station if you're too tired to walk!). Standard Itinerary for the Midweek (Mon-Fri) Break. (This can be changed to suit you, email us with your requirements and we will get back to you). Day 1: Check in opens at 3pm, you have the afternoon to explore Florence then we meet at the B&B for dinner at about 8pm. Dinner is a typical Italian three course meal prepared by our resident Italian chef and includes wine. Day 2: Cooked breakfast and then it's onto the horse riding! 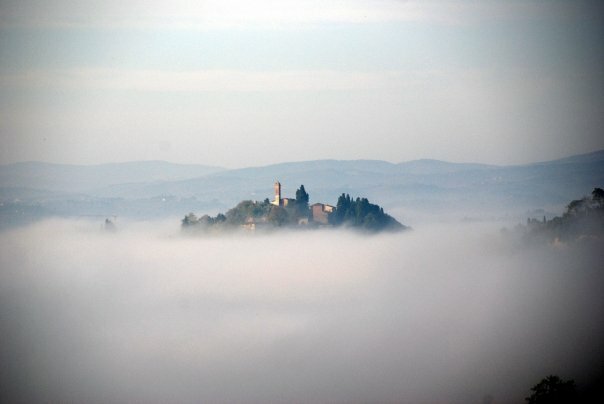 You will then stop for lunch at an old medieval castle in Tuscany, before returning to the B&B (This is an example and the exact ride you do is dependant on your experience, your requests and the availability). Then you can relax a while while we prepare your dinner! Day 3: After breakfast we take a short walking tour of Florence (approx one hour) then you have some time before we meet for a fabulous three course lunch at our favourite restaurant (included in the price). After lunch is more free time for shopping, sightseeing or relaxing. We also pay for you to enter any museum of your choice in Florence. Then at about 7pm we meet for Apperitivo, one free drink is included and as much food as you can eat! Day 4: More yummy breakfast and onto another day of horse riding through beautiful Tuscany (choice of rides available). And afterwards? You guessed it, mouth watering food awaits you back at our B&B! Day 5: Sadly, after breakfast it's time to say goodbye. Check out is at midday. But don't be too sad, we are sure that after all the fun you've had you'll be back again in no time! Very often people who stay with us go on to keep in touch with each other for years to come. This costs from just €389 per person for the standard package. If you choose to do different rides you may have to pay transportation costs which vary. If you want to be adventurous and take public transport we will pay this for you! The standard itinerary for the Weekend Break is as above, but without 'Day 4'. The Weekend Break (Fri-Mon) costs from just €259 per person. If you want to tailor you holiday to suit your own personal requirements the price can go up (for example an extra days horse riding or extra nights accommodation) or down (for example a 'non-rider' friend or family member would obviously not pay to go horse riding!). Our address is Via Cavour, 15. We are situated a two minute walk from the Duomo in Florence, just a ten minute walk from the main train station. You can reach most of the major sites in Florence within ten minutes walk. The B&B Maison has been opening it's doors to travelers for many years and has recently been refurbished to a high standard. This means you can enjoy our ancient palazzo with frescoed ceilings and original tiled floors, without the inconvenience of renaissance style plumbing or electrics! We have two large airy rooms which can accommodate up to six people per room. They both have a view of Bruneschilli's Duomo and Giotto's Campanile. The B&B is centrally heated throughout, and there is hot water 24 hours. We have a large kitchen (but with all the food we provide we're sure you won't need to use it!) and two good size bathrooms with showers. The B&B is cleaned thoroughly everyday. We provide you with towels (if you forget your own) and linens. We do have double beds available, when you book you should let us know if you prefer a double bed and we allocate these on a first come first served basis. We also have bunk beds (which we usually reserve for the kids), but big kids can use them too! Just let us know your bed preferences when you book. Your hosts for the week are Sharon, Lorenzo and Fiona! 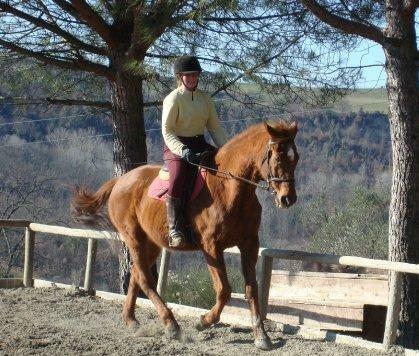 Sharon is a qualified riding instructor from England who moved to Tuscany nearly 3 years ago to live her dream of riding the wonderful horses in Tuscany. Lorenzo is a fantastic Italian cook from Rome, who moved to Florence several years ago in search of a quieter life. Then he met Sharon and his quest for the quiet life was thwarted! Fiona, the newest addition to our family, is a white Boxer puppy. She is super friendly and adorable, but if you are afraid of, allergic to or can't touch dogs for religious reasons, please don't book at the B&B Maison. Payment only cash at the arrival. From the Duomo take via de martelli (banca toscana is on the corner) walk a few minutes down this street and as you pass the Palazzo Riccardo Medici the road becomes Via Cavour. We are Via Cavour, 15 - about 40 metres past the tourist info. Ring the bell for B&B Maison and come up the stairs!